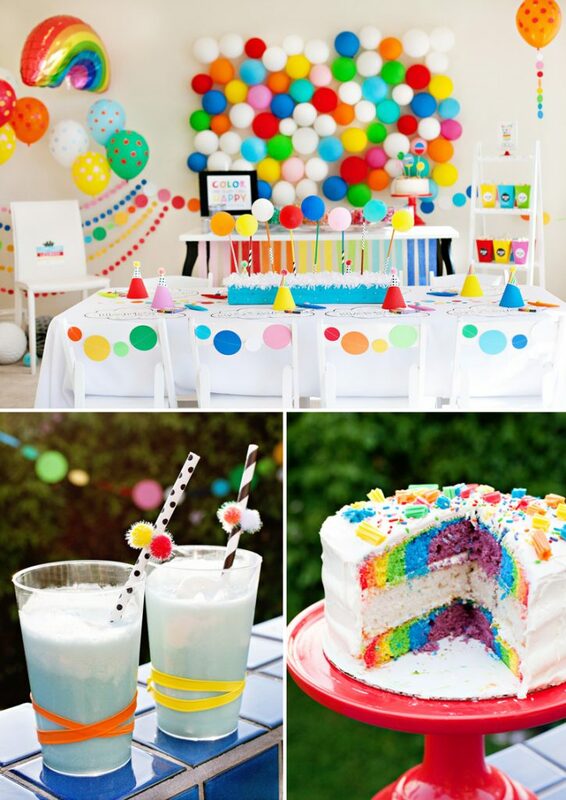 We’ve featured lots of rainbow parties here on HWTM over the years, but this is the first one that I designed myself. I wanted it to feel fresh, modern, vibrant, and HAPPY! 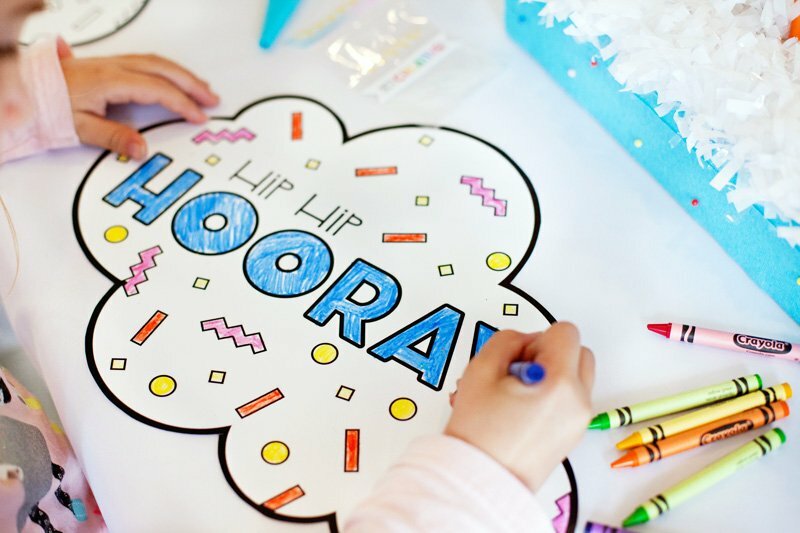 Coloring is always a great way to keep little ones entertained! These cloud-shaped placemats come in 2 designs and are included in the free printables. Note: The placemats are formatted on 11×17 paper. I printed them as black & white engineering prints at Staples. You can fit 2-up on their 18×24″ paper, which makes them less than $1 each. 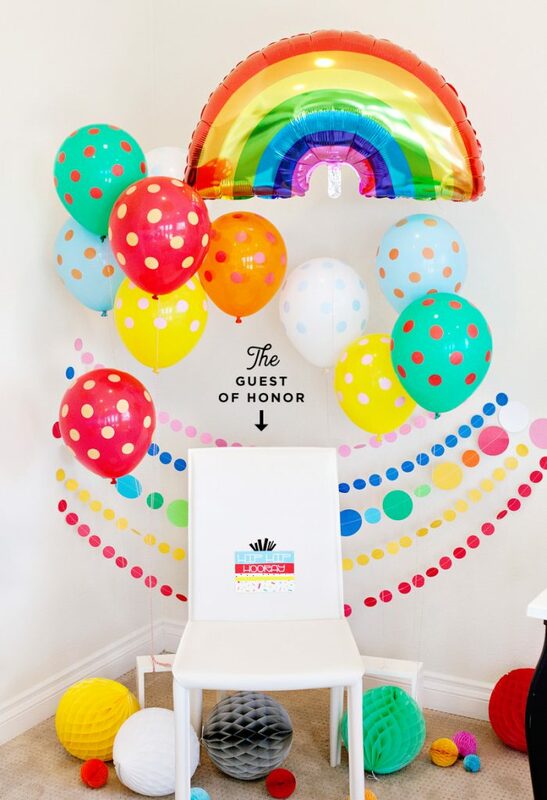 Rainbow balloons, circle garlands, and honeycomb balls make for a happy-go-lucky photo backdrop and gift-opening spot! For the circle garlands, I used craft circle punches to cut circles from colored card stock, then sewed them together with my extremely limited sewing machine skills. You can also use hot glue to make the garlands, as demonstrated in this other rainbow chair design. I used 1.5” circle punches for the smaller garlands shown here. A combination of 2” and 3” circle punches were used for the big ones. To decorate the cake, I used kitchen shears to chop up Rainbow Twizzlers into giant “sprinkles”. These provided a nice size contrast to the regular rainbow sprinkles. I also hung garlands on the chair backs and designed an artsy “faux birthday cake” centerpiece, which I’ll post a tutorial on later. In a nutshell though, the centerpiece is made from floral foam bricks, crepe paper, and tissue fringe + balloon and wood dowel “candles”. 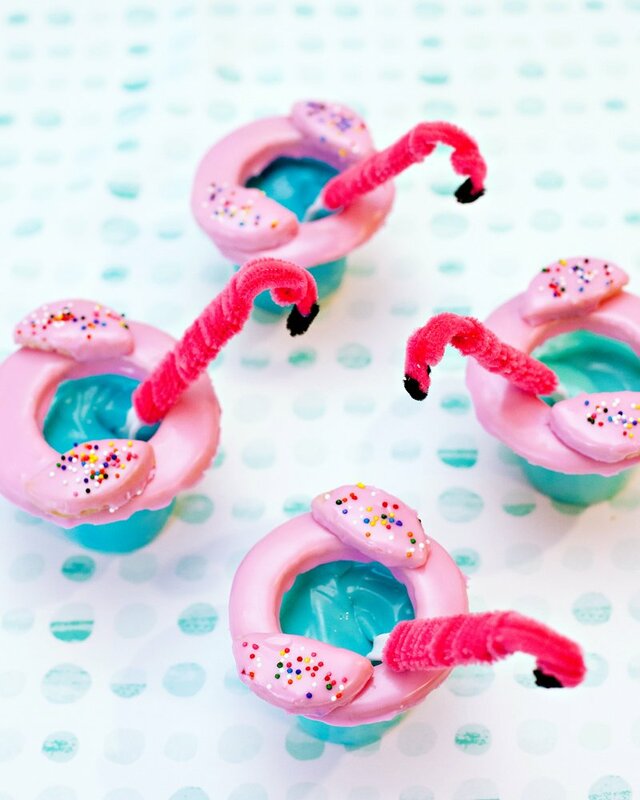 Kids will go crazy for this sweet and colorful treat! To make it, add approximately 1/2 cup of white melting chocolate per 8 cups of popped kettle corn or regular popcorn. Pour the melted chocolate on top of the popcorn and toss gently to coat. 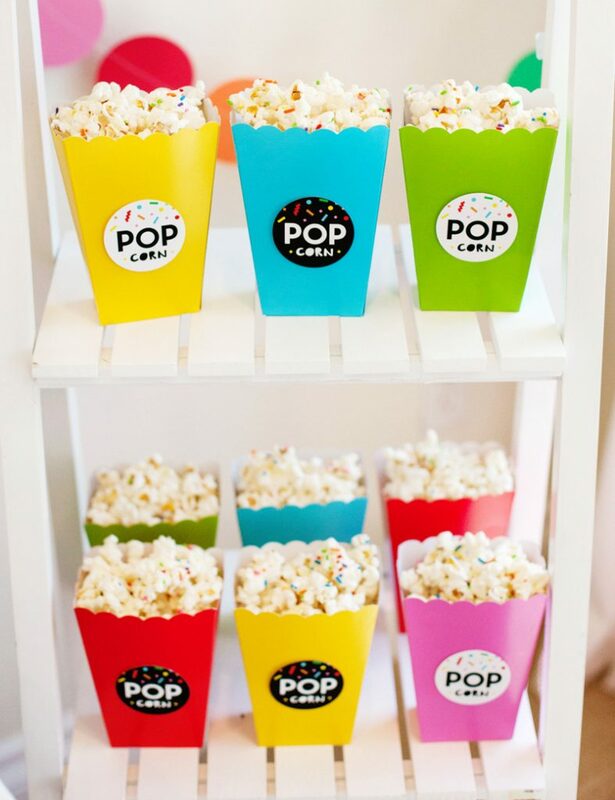 Spread the popcorn out evenly on a baking sheet, then sprinkle generously with rainbow sprinkles. Let dry for 2-3 hours. 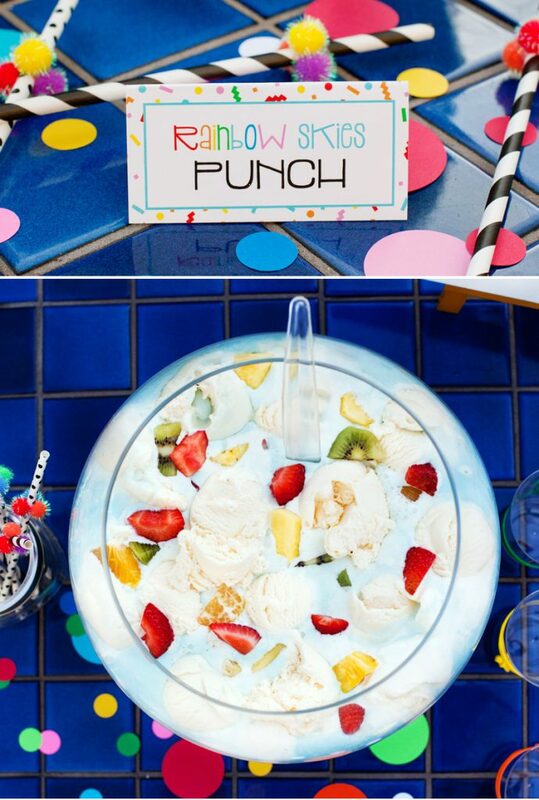 The signature drink was a “Rainbow Skies” Party Punch with blue fruit punch, vanilla ice cream “clouds”, and colorful chopped fruit. The punch was served in clear cups that I embellished with skinny balloons (the twisty kind you use to make balloon animals). 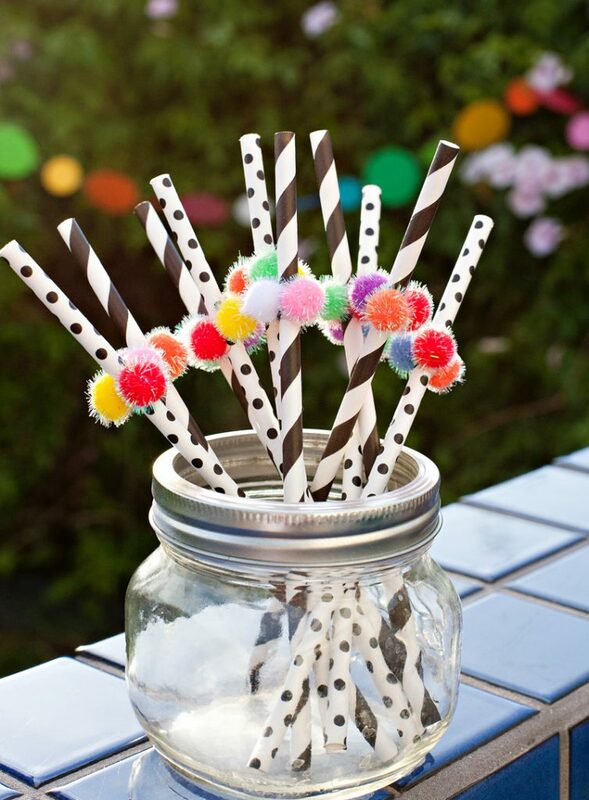 Colorful sparkly craft poms were the perfect ingredient for fun party straws! 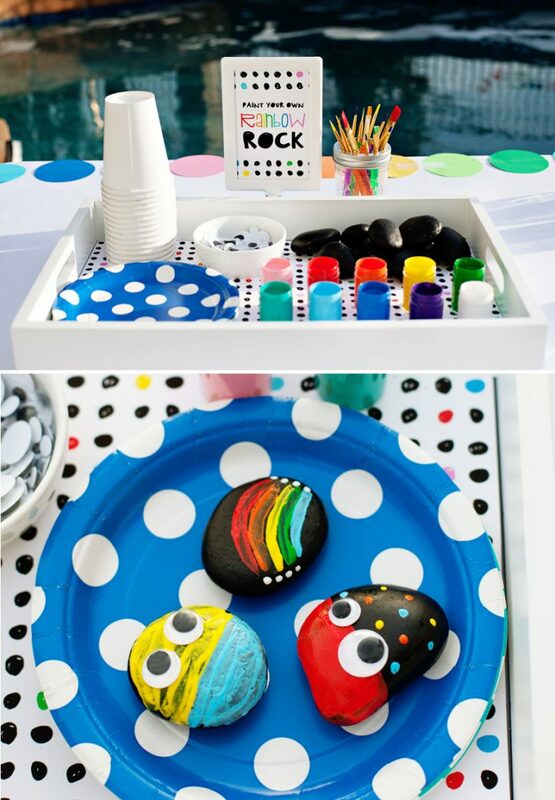 For this craft, you’ll need to collect or buy a bunch of large, smooth stones for your party guests to paint. You can also purchase rocks that are pre-painted with a matte black coating (or add one yourself), which will make the bright paint colors really POP! 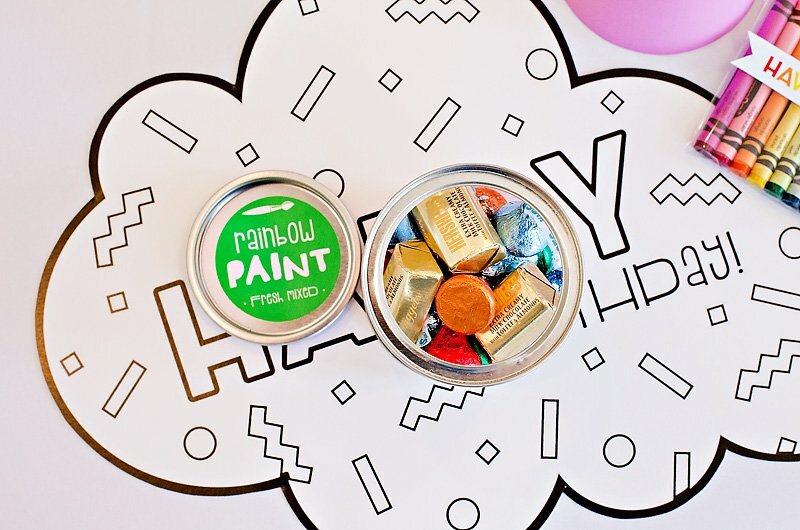 For the craft supplies, you’ll need kid-friendly paint in a rainbow of colors, small paint brushes, and any extras you want to include, like rhinestones or googly eyes. Helpful Tips: Paper cups filled with water are helpful for rinsing brushes. Paper plates are great for drying time and for saving your table cloth from paint splatters! 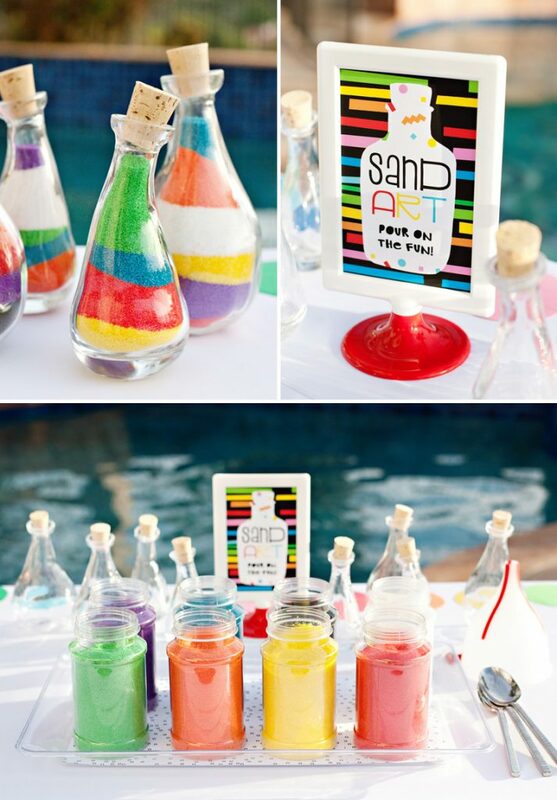 Kids will love making their own sand art creations to take home and display! 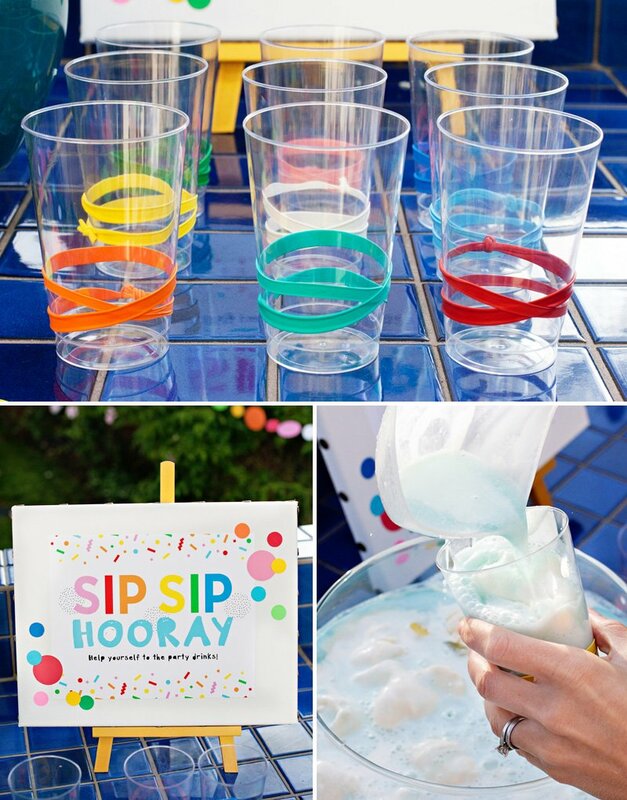 You’ll need colored sand, clear containers with tops, big spoons, and FUNNELS. Choose from plastic or glass containers, depending on the ages of your guests. I used inexpensive glass bud vases (purchased at Ikea) plus cork bottle tops. To fill the bottles, insert the funnel into the bottle top and pour the sand in slowly. Alternate colors often to create the pretty layered look. Older kids should be able to pour the sand themselves. For younger kids, it’s best to have them pick out the sand colors and help by holding the funnel in place while an adult pours the sand. You can also let younger kids spoon the sand into the funnel while you hold it. Since I partnered with Hershey’s on this party (in celebration of their shiny new Hershey’s KISS colors) – I wanted to design a candy station that really made the individual colors stand out. The result was this fun “paint palette” inspired favor station! 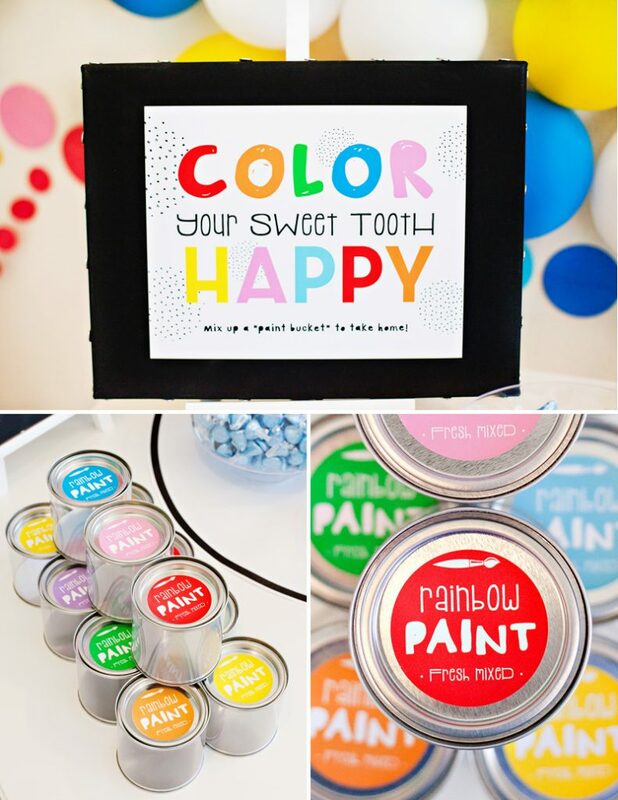 Hope you found some inspiration here for your own rainbow art party! If you have questions, please feel free to ask away in the comments section below. P.S. 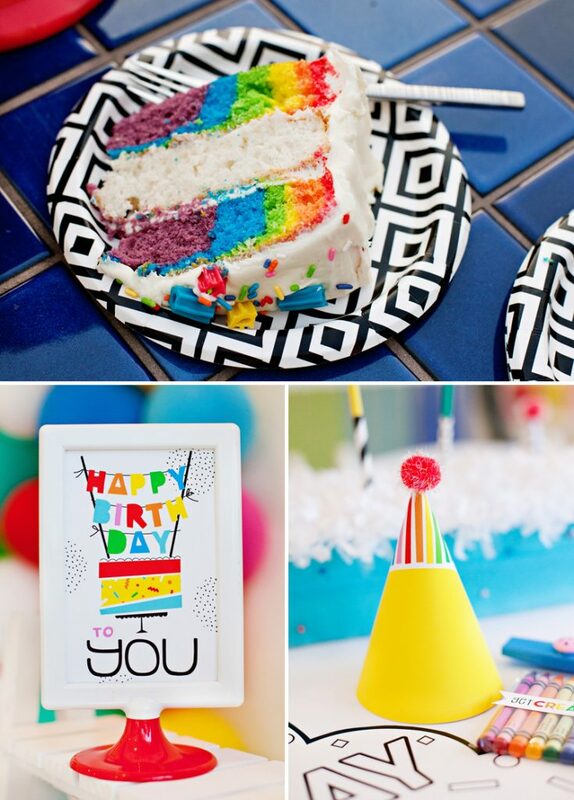 For more inspiration like this, check out our Rainbow Party archives. 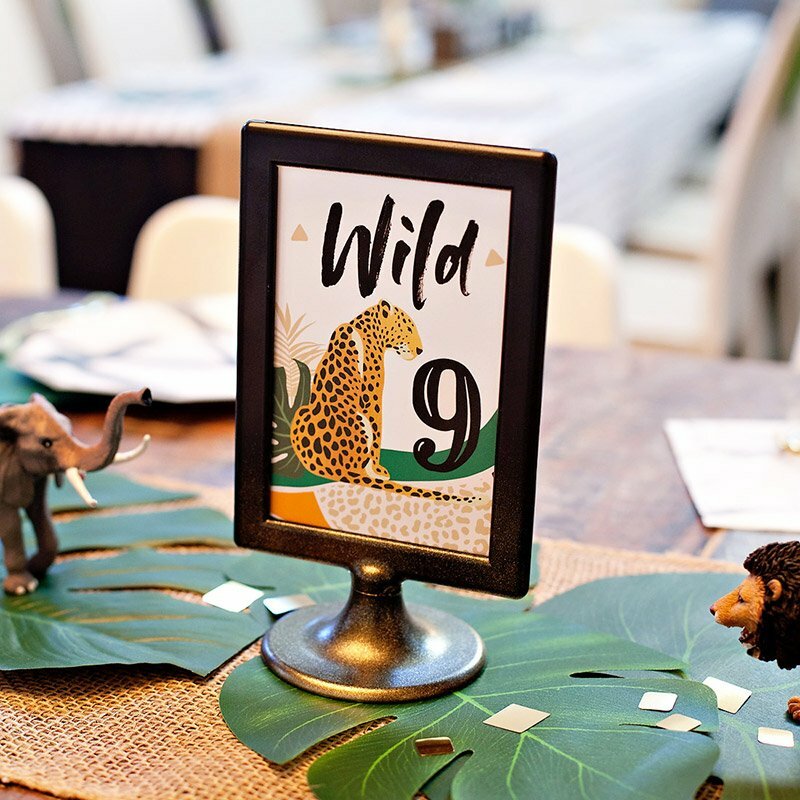 Such beautiful and fun decoration choices for a kids party! 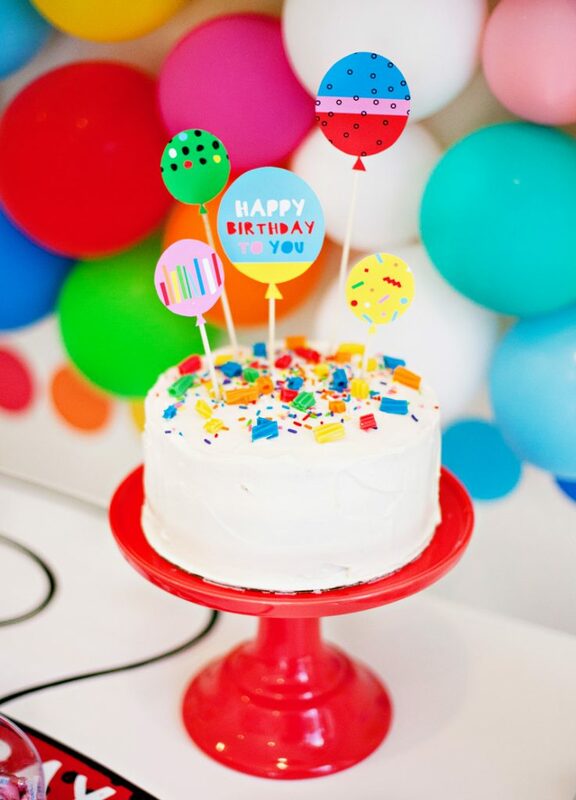 You really can’t go wrong with vibrant colours in creating an excitement-filled birthday for children. 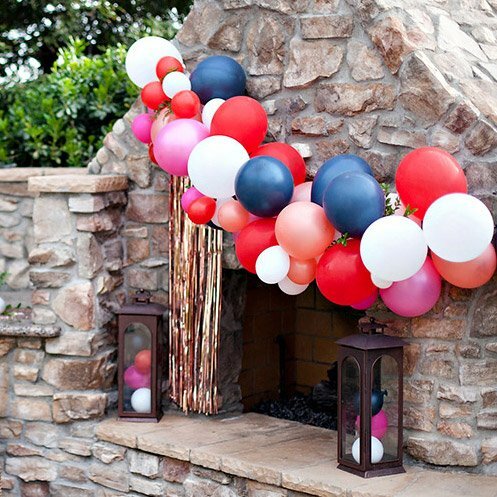 There’s a lot of great creative DIY ideas here as well that can help produce a high-quality party at a low cost. The Modern Rainbow Art Party theme sounds great. 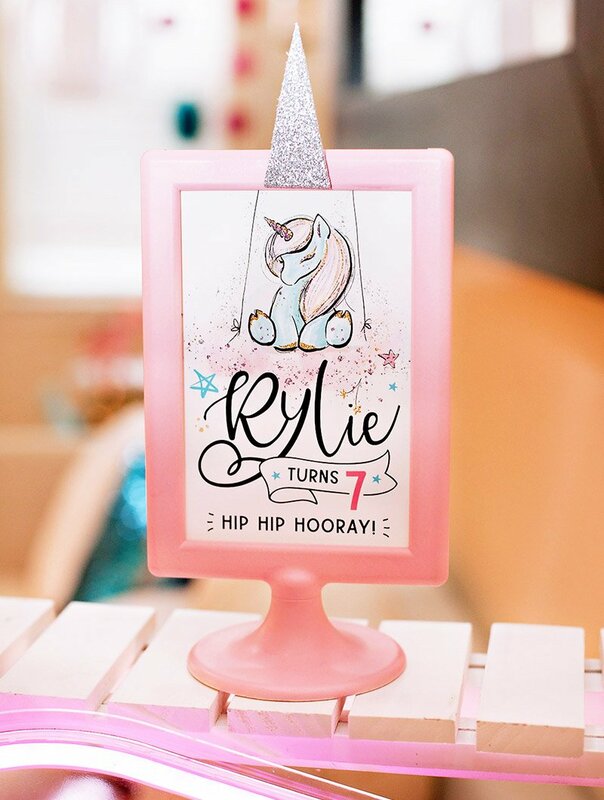 The idea of art and crafts party is great, kids love doing art and crafts and painting party is also a great party entertainment. 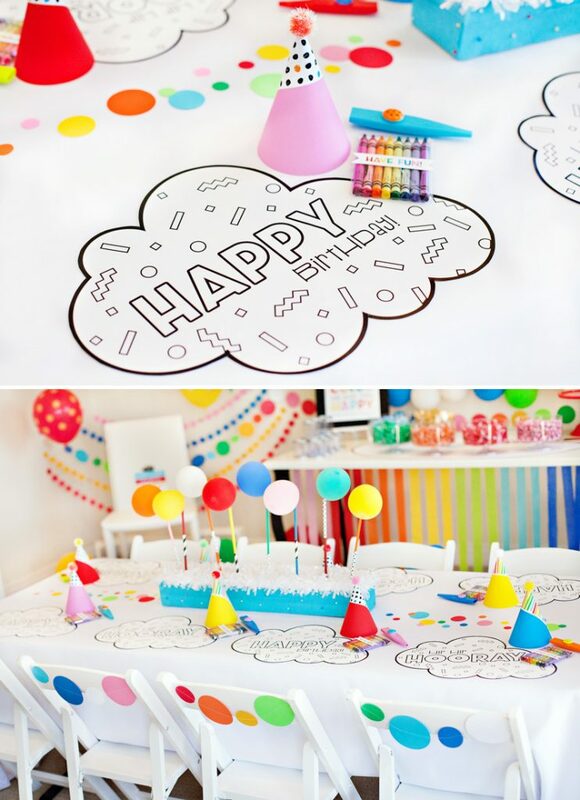 Thanks for the post, you can also see crazybirthdays.in for more such great birthday party ideas. This looks so colorful and bright. I love it! I keep getting an error when I’m clicking on the free printables link? How can I access them? 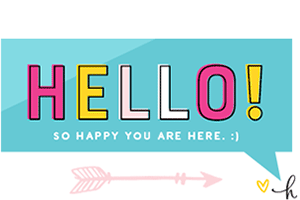 Hi Laura – I just tested the link and it worked for me… here is the full URL just in case it works better for you to copy/paste it into your browser: http://www.hwtm.com/wp-content/uploads/2017/02/HWTM-Modern-Rainbow-Party-Printables.zip Please LMK if you have any further trouble! I’m in love with the photo frames used. I saw them at the fisher price party as well. Can you tell me where to get them from? Also, are there any printables for a hot air balloon themed party? Those are the Tolsby frames from Ikea. :) You can also find them on Amazon for a more expensive price, but sometimes that’s easier than getting all the way to Ikea! You can also spray paint them for added color. What a fab birthday party! Hi :) I used the 3×3″ size containers for the favor tins. You can find them here. Also – unless you need a ton of them, make sure to click on the “buy smaller quantities” tab – where you’ll find them for $1.36 each. Beautiful rainbow party. Everything so elegant and colorful. I started to think about one thing I like the most about this party but could not make up my mind :-). Straws, sand bottles, candy station…. all stand out. Jus WOW. What a fab party, jus love the piece of arrangements, looks very lovely. 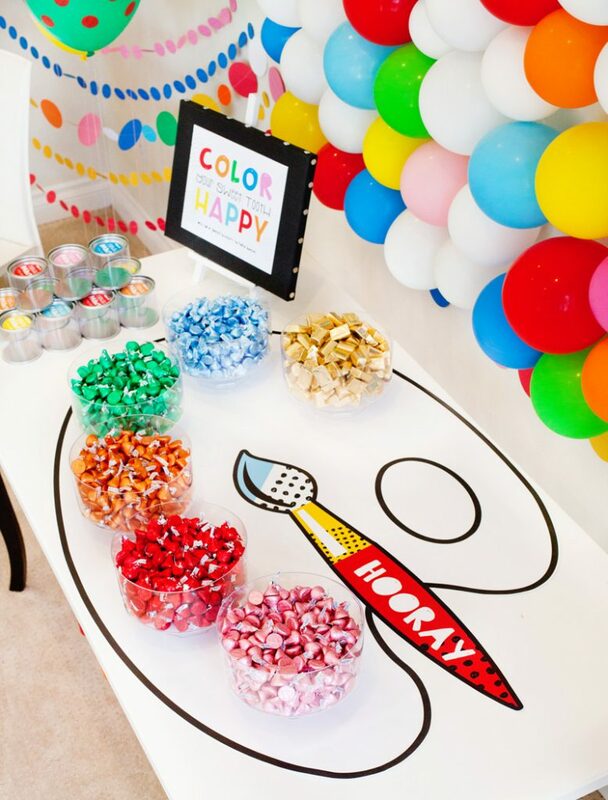 Balloons and paper works are usual ones but color sand makes this party even colorful. Fab. 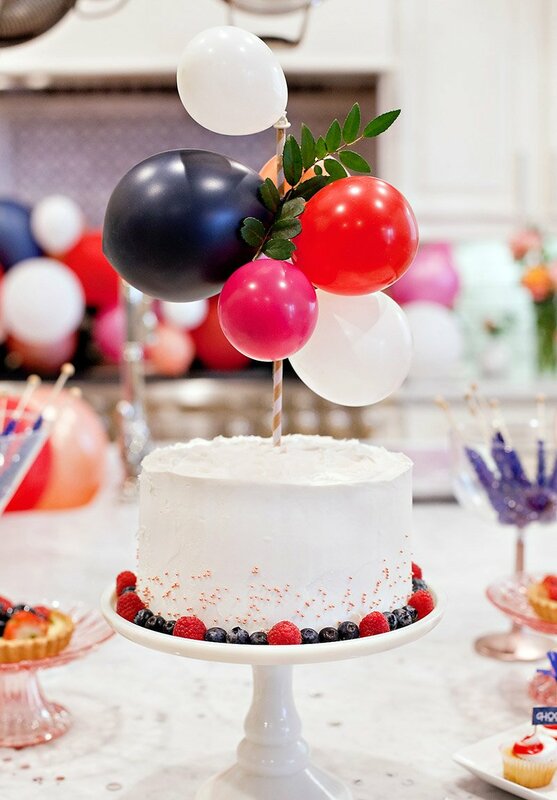 A creative idea showcased at a birthday party can turn out to be an absolute trendsetter. A modern rainbow art party can rightly be called as one. The whole theme exudes a beautiful, playful and colourful vision. Kids are surely going to love this one. I love this party! It’s so beautiful with all the vibrant colors. I’ve tried clicking on the link for the rainbow cake but it does not go anywhere. Would you please share the link for the cake? I love this party along with all the decorations! Would you please share the invite for this party as well? or let me know what you used? Kid’s are enjoying a lot of different color making art. Color is the key of spreading happiness. Mixing of more colors gives the pleasant feel and extra fun. I really like the rainbow art party theme.